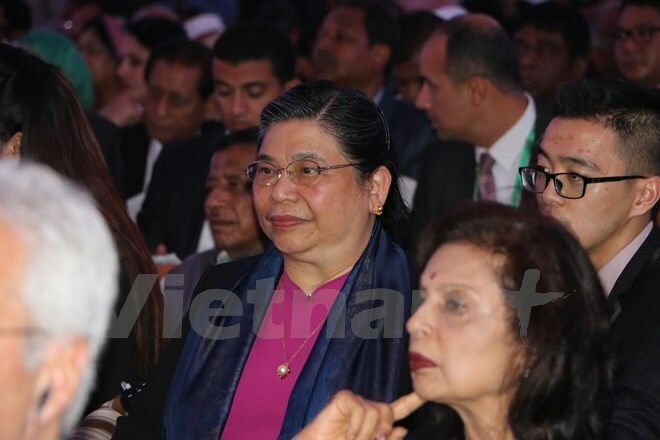 Dhaka (VNA) – A Vietnamese parliament delegation led by National Assembly Vice Chairwoman Tong Thi Phong attended the 136th Assembly of the Inter-Parliamentary Union (IPU) that was held in Dhaka, the capital city of Bangladesh, from April 1-5. Themed “Redressing Inequalities: Delivering on dignity and well-being for all”, the meeting attracted 670 parliamentarians and 164 delegations from 132 countries worldwide. In his opening speech, IPU President Saber Hossain Chowdhury highlighted the union’s expansion of membership and called on parliamentarians to address global challenges such as climate change and conflicts. Participants are due to discuss decisive actions to end the rising social, political, and economic inequalities, as well as to promote women’s access to financial resources. Earlier on April 1, the Vietnamese delegation also attended a forum of women parliamentarians, where Vietnam proposed building a model of trilateral cooperation among IPU, member parliaments and international organisations in facilitating women’s access to financial services. Vietnamese lawmakers also attended meetings of the ASEAN 3 and the Asia-Pacific Group on the occasion. During the Asia-Pacific Group’s meeting, Vietnam, together with Iran and Japan in their capacity as members of the group’s executive board, reported the outcomes of the board’s meeting held on March 30-31. The group also elected additional members to the executive committee of the IPU Young Parliamentarians’ Forum. On the sidelines of the assembly and related meetings, head of the Vietnamese National Assembly’s Committee for External Relations Nguyen Van Giau met a delegation of Thai parliamentarians. He expressed wish that both sides would work closely together at multilateral forums in the region and the world, especially promoting the development of ASEAN Community for the benefit of the bloc as well as Vietnamese and Thai peoples in particular. On the occasion, Giau conveyed his invitation to the Thai parliament to attend an IPU conference for the Asia-Pacific region on climate change response slated for May 11-13 in Ho Chi Minh City.